Men can go for wrinkle free shirts with short sleeves for work during monsoons. Strictly avoid wool, linen and thick fabrics during monsoon. One must try to balance dull weather by wearing bright colours, such as red, green and blue. If you prefer wearing Indian clothes, you may opt for leggings and tunics. Going to work during monsoon can be a hassle, especially when one has to strictly wear formal or semi-formal clothes. 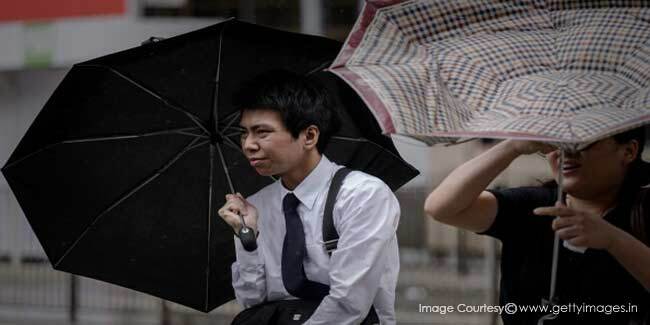 Here are some tips to dress to work during monsoon. Men have fewer options in terms of clothing when compared with women. You can go for wrinkle free shirts with short sleeves. Strictly avoid wool, linen and thick fabrics during monsoon. The thinner the fabric is, the better it is to wear during monsoon. You may also wear smart formal jackets to work. Opt for rubber soled shoes and avoid leather as leather can get spoilt after coming in contact with water and muck. Those, who have a casual work surrounding, can wear comfortable sports shoes or sneakers. Considering that monsoon is characterised by dullness, one must try to balance it by wearing bright colours, such as red, green and blue. Pastel shades, such as pink, light blue and white should be avoided because it is difficult to remove muck stains, puddle splashes and patches. Since the sun will mostly be covered by rain clouds, you can pull your black clothes out. Girls may opt for dark pinks, dark blues and other dark colours to avoid the clothes from getting transparent when they get drenched. If you prefer wearing Indian clothes, you may opt for leggings and tunics. Wearing salwars and kurtis should be avoided as these can be troublesome during monsoon due to muck. Besides, wrapping dupattas around the neck may be uncomfortable. Must you wear salwars, substitute dupattas with scarves. Colourful scarves that have metal loops and are studded with semi-precious stones look elegant. Accessories are an important part of one’s attire during monsoon. Accessorise your look by buying stylish umbrellas that are of pastel shades with delicate frills in the tips. While women may go for bright colourful umbrellas, men should opt for colours, such as metallic silver, black, brown or navy blue. Women must also give a close look at their bags. When shopping for bags, make sure that they are waterproof. Limit them to shades of black, grey and blue. Leather and cloth bags must be avoided as they are prone to possess very little absorbance and breed fungus. Never ignore your make-up and hairstyle. Ensure that you use water-proof kajal and other cosmetics. Hair tends to get extremely frizzy during monsoon. Therefore, avoid leaving hair open.